I got a pleasant surprise for my birthday, though it wasn’t intentional. 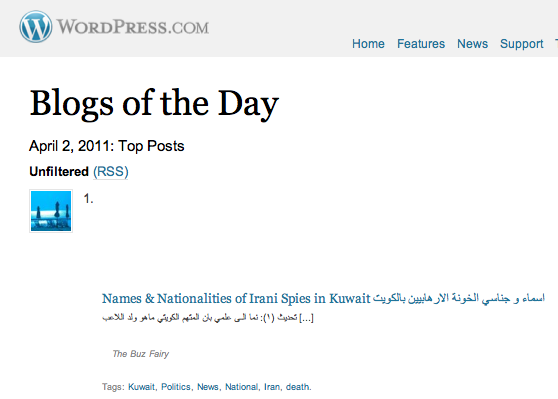 I made it to the #1 spot on the top post on WordPress’s Blogs of the day list. That’s WORLDWIDE, beating every other blog on earth. This is pretty major. My blog was the top one for the day of April 2nd, 2011. No matter how you slice it, it is still awesome. No wonder I’m super excited about my birthday this year. I’m telling everyone, today is going to be a great start for a brand new decade. And it looks like I’m right on track for that. Wallah it beats everything else… When I saw it ams, I thought something was wrong with my mind. How r u after ur accident? Everything ok I hope?